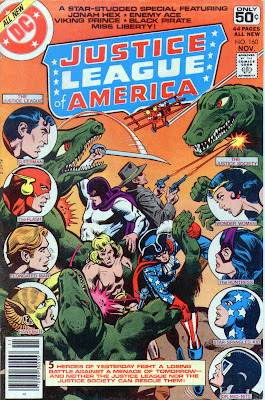 Matching Dragoons: Justice League of America #160 "Crisis from Tomorrow!" Justice League of America #160 "Crisis from Tomorrow!" The story starts off with Superman, Wonder Woman & Flash all on the Cosmic Treadmill and dragging along Huntress, , Elongated Man, Dr. Mid-Nite, Hawkman & Star-Spangled Kid. We get a one page recap and then we are in 3786 where the Lord of Time is really really worried. Just then the five heroes from the past (Jonah Hex, Viking Prince, Miss Liberty, Black Pirate and Enemy Ace, all attack the Lord of Time's castle. The five manage to break down the castle door but the super smart computer grabs a T-Rex from the past to attack the five. Jonah's pistol makes a ZAROOM sound effect (must be hollow point bulets). As Enemy Ace attacks the dino, the remaining four use this chance to rush the castle. But the computer pulls in several hundred reptilian apes from the future and all five are defeated. Now the Lord of Time's only hope of stopping his own creation is for the JLA to show up. Back on Earth, Aquaman is talking to the doctor taking care of the fallen JLA/JSA members. He ends up going to get some special equipment. Back in the future, the runners on the Cosmic Treadmill slam into a a wall in time. They can't find a way through until Wonder Woman throws Superman like a javelin through the wall. this, however, knocks out Superman. Our heroes find the LoT's castle and Hawkman is shot out of the sky by lasers. Wonder Woman is the next to fall, getting hit by another laser. 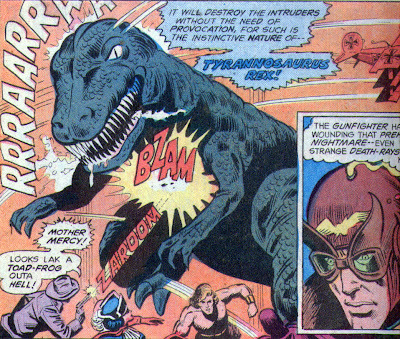 The Flash vibrates part of the castle wall to dust and gets inside but is attacked by a pterodactyl and is knocked out. The super computer states that the heroes will fall within 8 minutes and the stoppage of time will start in 9 minutes. A huge robot from the future beats the crap out of SSK, Huntress and Dr. Mid-Nite. The Elongated Man, emoting about how he is outclassed manages to trip the robot and it falls apart. He then finds the computer and the Lord of Time. E-man decides to short circuit the computer using...himself?!?!?! The thing blows up and Ralph Dibny saves the day. Epilogue: Everyone is healed thanks to blah blah blah yakkity blah blah..
Timeline: Well, in these two issues Jonah winds up in 1978 and 3786. 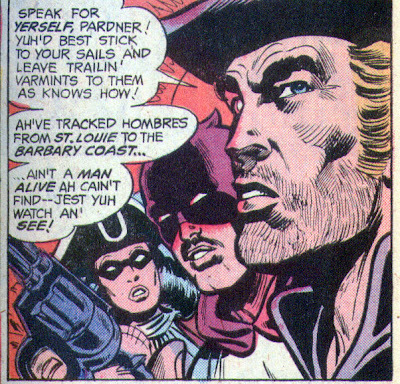 Two characters that should have never interacted with the DCU were Jonah hex and The Warlord. You're braver than I am, Dwayne, I'm not tackling this one. I do have another crossover or whatever it's called with Hal Jordan and Jonah camping in the wilderness that I'll do one day. Ah,Ginger, you remember JLA 198 & 199. While not as terrible as THESE two issues, 198/199 did feature Jonah Hex, Scalphunter, Bat Lash & Cinnamon (out her time by about 20 years) teaming up with Flash, GL, Zatanna & Elongated Man while Supreman battled ...... THE LORD OF TIME!!!!!!!!! All you surprised people may now close your mouths. 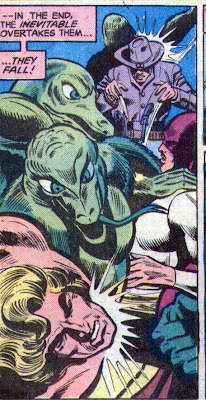 Ok, Superman couldn't take down Jonah, but Reptilian Apes could? On the other hand, it is only right and fitting that Ralph Dibny save the day. Actually, it was Hawkman punching Jonah and Superman was taken down by a magical German Tri-plane. 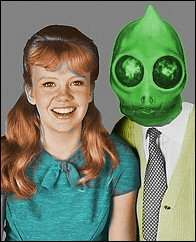 It still staggers the imagination. A magical German Tri-plane flown by a robot zombie gorilla, I could understand.